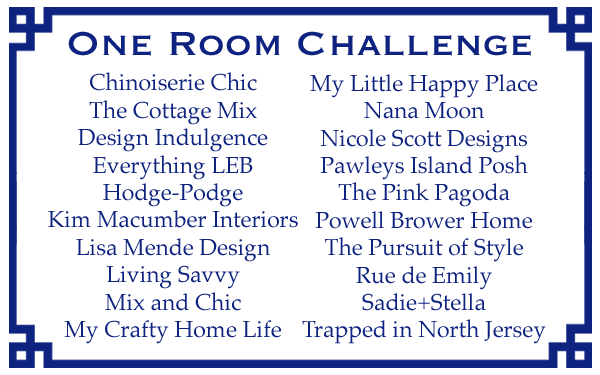 The amazing blogs listed above are all participating in the One Room Challenge. 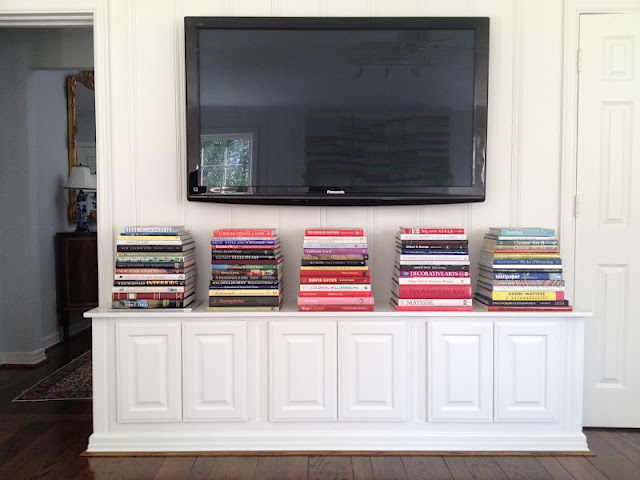 Linda, of My Crafty Home Life, created and organized the challenge. The objective is to finish a room in 6 weeks. 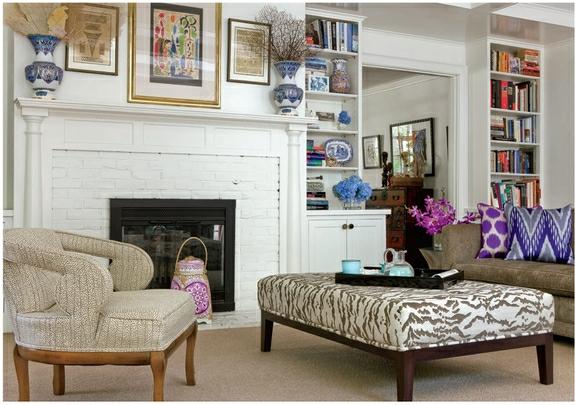 I've chosen my family room, which has never has never had much thought put into its appearance. Things have kind of landed in this room, and I've been too busy with life to care. I need a challenge like this to motivate me and focus my attention on something that should have happened years ago. 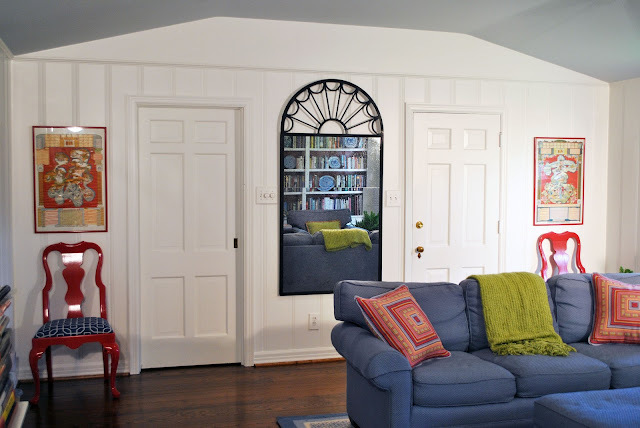 The six photos below show each wall of the room. My upholstered pieces have seen better days. We really use this room, and some of us can be hard on the furniture. The pets aren't helping matters. I love my rug. Dallas used to have a Stark outlet, and I bought it there. 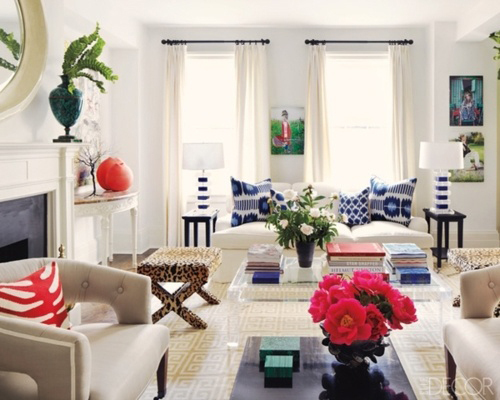 But, I shouldn't have put blue fabric on the blue rug. That's too much blue even for me. So, things will have to happen with the sofa and chairs. 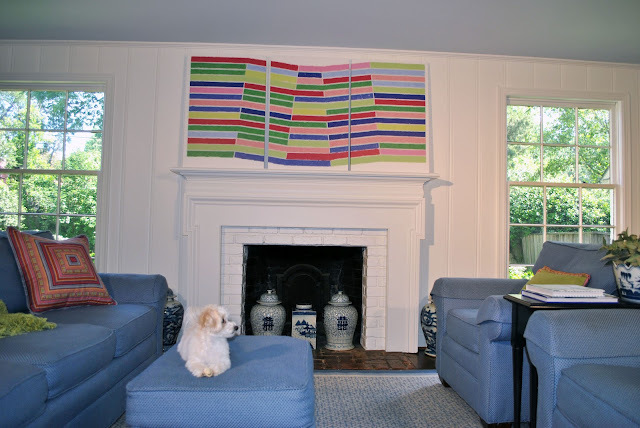 I went through a Frank Stella obsession and did the triptych over the mantle. I'm over that now and ready to move on. As for the bare windows, I'm conflicted. I know it would look more "finished" to have something happening. However, I'm not sure I want to deal with having anything. I can be very practical at times, and the dust factor influences the appeal of bare windows. Oh, and the green. 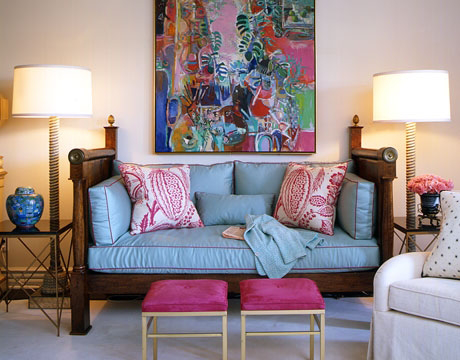 I went with green accents in this room, and I'm really a pink girl. And I need more. 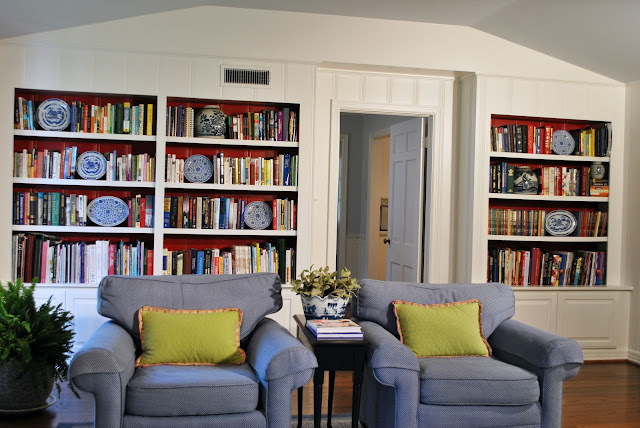 I'd seen so many bookcases that I loved with red walls, so I did that here. Again, ready to move on. 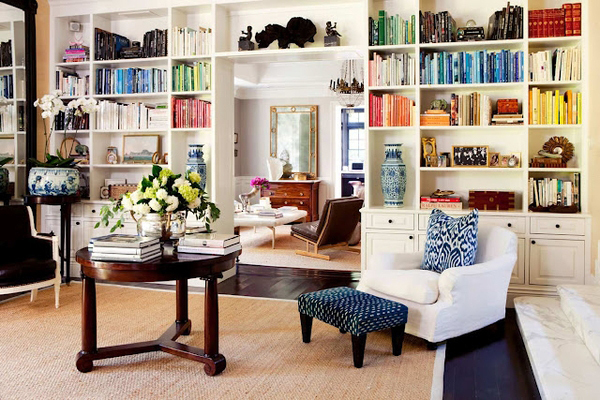 And these bookshelves have clearly never been styled. That needs to happen. This cabinetry wasn't here when we purchased the house. We had it created to look like the other cabinets in the room and the paneling on the doors. This wall is opposite the fireplace. I may leave it alone. This is the end of the room I like least. It's very unbalanced with the bookshelves opposite. I do like the mirror. I found it at a consignment store here in Dallas and bought it for a song. I saw the same one on 1st Dibs the week I brought it home. I found out it's Mastercraft, and I got an unbelievable deal. Much will need to happen on this end of the room. I'll be sharing my progress every Wednesday for the next six weeks. I hope you'll follow along and share your thoughts. I'd love advice and suggestions. 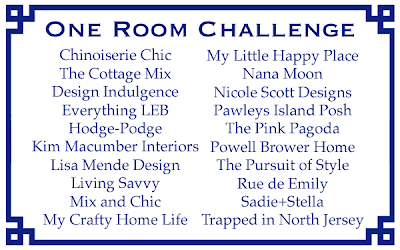 Lots of the other One Room Challenge participants are interior designers. I have huge enthusiasm for interior design, but lack any real experience. I'm really winging it here, so who knows what may happen. 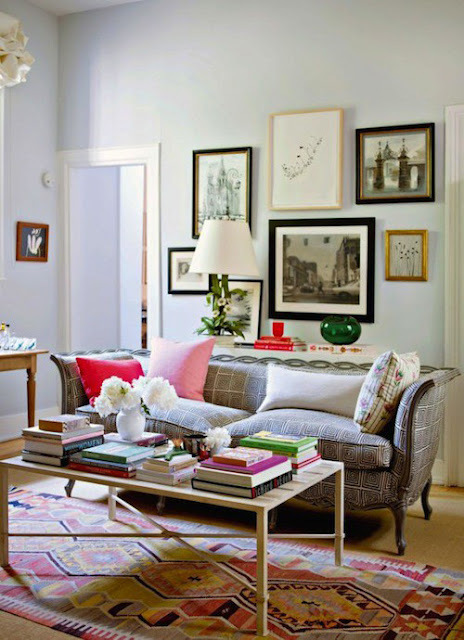 The six photos below are rooms I love and am planning to use as inspiration. Wish me luck -- I'll need it!